Hate crimes against Muslims in the United States jumped after the September 11, 2001 attacks and remain high more than 13 years later. 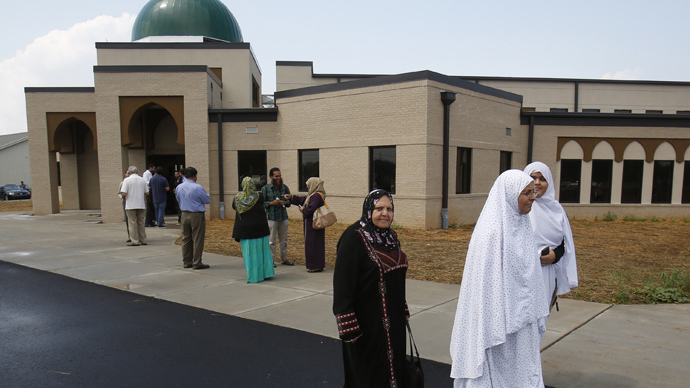 The recent murder of three Muslims in North Carolina is being investigated for a possible religious motivation. If the triple homicide is proved to be a hate crime -- defined by the FBI as a “traditional offense like murder, arson, or vandalism with an added element of bias” -- it would add to a high number of anti-Muslim hate crimes per year in the US. In the last few years, specifically anti-Muslim crimes have made up about 13 or 14 percent of hate crimes considered to be committed with a religious bias. That amounts to nearly 100 anti-Islam hate crimes each year from 2011 to 2013, according to FBI data. More broadly, since September 11, 2001, anti-Muslim hate crimes have consistently stayed anywhere from 100 to 150 in number per year. In 2001, that number reached nearly 500. Of all hate crimes, anti-Muslim crimes make up about 2 percent. Last year’s Israeli offensive on Gaza – spurring clashes that claimed the lives of 2,131 Palestinians and 71 Israelis, 65 of whom were soldiers, according to the UN – was the backdrop, if not possible motivation, for some recent anti-Muslim crimes in the US. In California last fall, mosques in Santa Cruz and San Diego were vandalized, and a shooting occurred at a mosque in Coachella. In November, headstones and memorials at a Muslim cemetery in Washington state were vandalized. In December, a Houston school teacher resigned after she made anti-Muslim comments on a political talk show. "I am so sick of the bacon-haters coming here and demanding that we bend to their culture -- no," Angela Box said. Also in December, the Kansas chapter of the Council on American-Islamic Relations called for state and federal investigations into the “intentional” killing of a teenager outside a Kansas City, Mo., mosque. The CAIR chapter in Minnesota also called for investigations of possibly religiously-motivated vandalism of mosques in St. Paul. Minnesota is home to an estimated 77,000 Somalis, most of them Muslim. "At the beginning we were thinking it was isolated -- a student or drunk person. But it isn't," Mohamoud Mohamed, spokesman for the Central Minnesota Islamic Center, told the St. Cloud Times about the vandalism incidents. "It is some person or persons who are causing damage and targeting our faith facilities." Many believe anti-Islam sentiment has been exacerbated by post-9/11 policing programs in major US cities, most high-profile of them being the New York City Police Department’s decade-plus Muslim surveillance operation that, by the NYPD’s own admission, failed to produce a single lead. Meanwhile, anti-Semitic crimes in the US consistently ranked higher than anti-Muslim crimes. For instance, in 2013, anti-Jewish crimes made up about 60 percent of religious-bias crimes in the US, besting all other religiously-motivated crimes, with anti-Islam crimes coming in second. Since the reporting of hate crimes by local and state law enforcement agencies to the FBI’s tracking program is haphazard, all of these numbers are likely low estimates. Despite the high number of hate crimes in the US, religious-bias murders are not common, as there were none recorded for 2013, for example. In 2013, 52.4 percent of race-related hate crimes were committed by whites, by far the leader in race-motivated offenders.